(CNN) -- Amid climbing luggage fees and a flurry of surcharges, holiday airline ticket prices are a bright spot for cash-strapped travelers. Holiday fliers may pay up to 15 percent less than last year for airline tickets. Domestic holiday fares last week were running up to 15 percent lower than last year, according to Rick Seaney, CEO of FareCompare.com, a consumer airline ticket research Web site. "The main reason for that is oil prices," Seaney said. "There's been a free fall in prices during the recession from November (last year) all the way through June," he said. "The bottom line for consumers is that the free fall in ticket prices from November to June, which have slightly bounced off the bottom the past few months, are still historically good deals," he wrote in a follow-up e-mail. Still, flexibility and keeping an eye on fare fluctuations will probably yield the best deals. 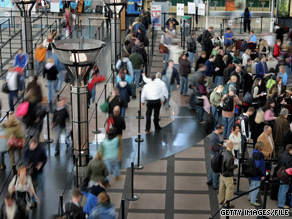 "I think the best time to buy the fare is when it seems really cheap to you," said George Hobica of AirfareWatchdog.com. Prices can often change as much as three times a day for certain popular routes, he said. Signing up for regular price alerts from AirfareWatchdog, FareCompare and similar sites keeps travelers informed as prices fluctuate. FareCompare.com advises travelers to shop early and book tickets for holiday travel by the end of October for the best prices. Traveling on the busiest days will always cost more, Hobica said. In fact, late last month, many large airlines initiated a $10 surcharge on tickets for three of the busiest travel days -- the Sunday after Thanksgiving (November 29), January 2 and January 3 -- and followed up by adding the charge to more peak days through 2010. Hobica said the extra $10 seems "kind of like much ado about nothing," given the usual predictable and substantial price increases on peak travel days. The surcharge is "kind of good for consumers, because it tells them which days to avoid in both costs and hassle," Seaney said. It's an issue of supply and demand, American Airlines spokesman Tim Smith said in an e-mail. As Smith points out, the $10 charge shows up directly in the base fare amount before taxes, so it is essentially just a fare increase, and not technically a fee. If anything, this price increase should be yet another reason to consider being flexible with holiday plans. You'll find the real savings by traveling a day or two before or after the majority of holiday fliers, the experts said. For example, on Monday, Continental Airlines' Web site showed nonstop fares starting at $378 for a round-trip flight from Newark, New Jersey, to Chicago, Illinois, leaving on the Wednesday before Thanksgiving and returning Sunday. However, for passengers who stay an extra day and return on Monday, the airline's Web site showed tickets as low as $251. Historically, fares have come down dramatically on the Web the day before Thanksgiving, if you're willing to roll the dice and don't mind waiting until the last minute, said Melanie Nayer of CheapFlights.com. The spending doesn't end with the fare. Coach travelers should account for checked bag fees all year long and try to avoid exceeding luggage weight regulations. Unless you're careful, extra charges could add up to a bad start to your vacation. Airlines have slightly different regulations, but Nayer has some advice on what to look out for. "The biggest tip is before you pack your bags and go to the airport, get online to the airline's Web site and check the baggage fee limitations -- all of them have it on their site," she said. The easy-to-read charts explain exactly how much checking additional bags will cost, for domestic and international flights. While you are on the airline Web site, check your bags from home. This will not only save time by avoiding long check-in lines, but it could save money, too, since many carriers have started to charge extra for checking bags at the airport. Nayer also suggests checking your frequent flier status with airlines, as some membership levels are exempt from additional fees. Though fees seem to keep cropping up, 2009 is still a pretty good travel year for consumers. "There is a lot of increased competition out there between the airlines," Nayer said. "The power for travel right now is really in the hands of the consumer. You can get the flight you want if you search, if you're patient and you're flexible."